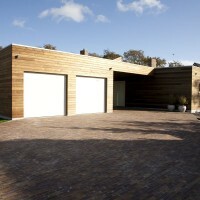 WHIM Architecture have completed the Villa BH in Burgh-Haamstede, The Netherlands. The villa is positioned on a rectangular plot of 35 x 50m, that is enclosed at 3 sides with similar plots and freestanding houses. On the back (North East) of the plot there’s an old embankment with several tall trees. From the living program; the kitchen, dining area and living are all orientated on this green scenery. 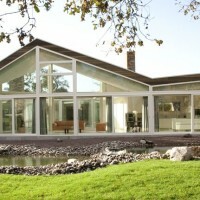 Here the villa has a glass façade over 20 meters long. Villa BH is inhabited by a couple 60+ of age. 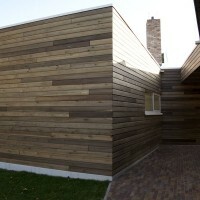 To optimize the accessibility of the house, all the program is situated on the ground floor around a patio. This enclosed outdoor space provides the owners the privacy they admired. 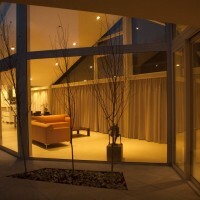 As at the same time the patio makes the living area an enlightened space and gives it a façade to the South. The floor plan is very open and a concatenation of program. The specific form of the patio widens and narrows the interior space, making it a variety of areas. The façade of the patio is completely from glass panels, giving the villa great perspectives in its interior but also towards the context. 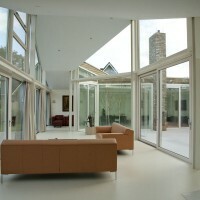 From the main bedroom, that is opposite of the living, there is a layered see through towards the existing embankment with the several tall trees as a central focus point on the plot. The ceiling of the living area has an extra height in the shape of a sloped roof. The physical appearance of this area is very unique and highly qualitative. Lifting the roof in this area enlarges the perspectives, from all the different areas inside villa BH to the existing treetops, that give this plot it’s specific character. 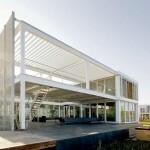 The villa is designed as environmental friendly with extra insulated façades, roofs and floors. The roof is covered with sedum, that regulates the distribution of the rainwater gently. On the flat roof are 20 solar panels for electricity. A heat pump warms the floors in the winter and cools them in the summer with natural temperature differences retrieved deep in the ground. As an extra heating there are 2 fireplaces for wood, one in the living and one in the TV-room. 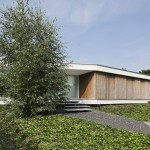 Villa BH is an environment friendly design that emphasizes the natural qualities of its context. The design is made over 2008-2009 by WHIM architecture. End of 2010 WHIM’s garden design will also be completely realized. 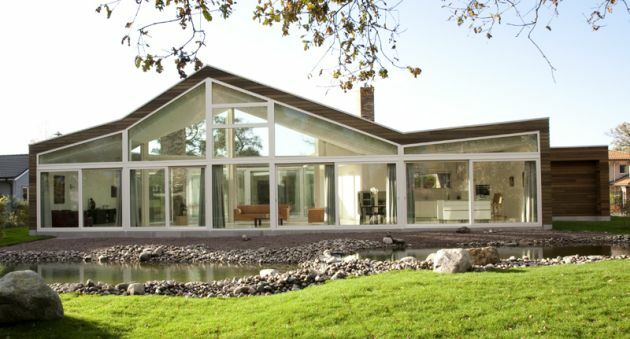 Visit the website of WHIM Architecture – here.